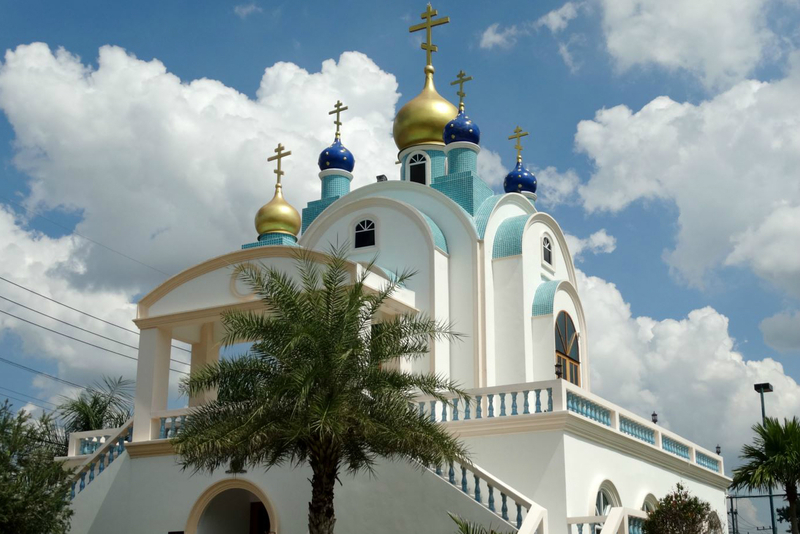 The Church of the Intercession of the Holy Virgin in Pattaya. By the time Lidya met Michel's father, Alexander de Valliere, she already had French citizenship. Both parents were Orthodox and when Michel was born in 1940, he was baptized at the Orthodox Church in Giberville. “My first Easter celebration in Bangkok was in 2001. I remembered how my mother prepared koulitchis and colored eggs,” Michel said. “I cooked them accordingly for being blessed at the St Nicolas Chapel.” This has become an annual tradition for him. Hataipat Phungpumkaew, a lecturer in Tourism and Hospitality Management at the Burapha University International College, is a Thai parishioner. “I first came to the church in 2009 as a visitor,” Hataipat says. “My Thai friend introduced me to the Russian Orthodox Church, which was in a small house, not far from the Royal Palace on Sukhothai Road. “From the Christian point of view, a person is saved for eternity by following Christ. This does not mean that we want to turn the Thai people to Orthodox Christianity at any cost,” he said. “Religion is not Coca-Cola. It is not a product that requires advertisements. We must give an answer to any individual who is truly asking and prepare him. We must baptise him and teach him how to be a Christian. That is why I am here". “I decided to get baptized in 2013. All the Russian parishioners and our priests have called me Daria ever since. I quite like this name,” Hataipat says. “So many of my colleagues always questioned me on how could I become friends with Russian people. They thought Russians keep a distance from Asians.” She, however, insists that the church and God’s love bind people regardless of nationality.